This was one of those days when my best intentions to prep, photograph, cook and write up tonight's Latvian Wild Mushroom and Potato Soup seemed destined to fail. First, I'd forgotten to charge the camera battery, then, my kids had "cooked" earlier in the day, and left crap all over the counter and the sink brimming with nearly every pot and pan in the kitchen. Chaos reigned supreme today, and while I didn't get all the shots I wanted, in the end, I got the Latvian Wild Mushroom & Potato soup made and it was down-right delicious - Victory! 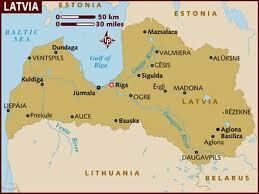 Located in the Baltic region of Northern Europe, Latvia is bordered by Estonia, Lithuania, Russia and Belarus. Up until the 1800's, the Latvian people were indentured as serfs, except in Eastern Latvia where emancipation came decades later. Traditional Latvian cuisine is based on locally grown food, relatively inexpensive ingredients such as dried peas, pork and bacon. Potatoes, wheat barley, cabbage, onions, eggs and wild mushrooms are all staples Latvians enjoy. For the most part, Latvian cuisine uses few spices and tends to be high in fat, originating out of historic necessity to eat foods that would sustain the body until the next (sometimes uncertain) meal. Because the country is located on the East Coast of the Baltic Sea, fish is also enjoyed in the country. Heat olive oil and butter in a large soup pop. Chop wild mushrooms and saute in olive oil and butter until soft. Add white wine. Add potatoes, water, stock and salt and pepper. Bring to a boil then reduce heat and cook until potatoes are soft. Meanwhile, fry bacon in separate pan till cripy. Drain on paper towel, remove all but 2 Tbsp. fat and saute onions in grease. When potatoes are soft, puree about 3/4 of the mixture, then add back into soup pot. Add bacon and onions to soup and simmer. Add heavy cream, paprika and adjust salt and pepper to taste. Ladle into soup bowls and tops with a dollop of creme fraiche and chopped dill. Serve with salad and hearty bread. Living in Latvia for 5 months now, I do confirm presence of dill is non-negotiable in Latvian cuisine.